Denver will host thought leaders in real estate and development from around the country during this week’s Smart Growth Conference Feb. 13-15. Photo Courtesy epa.gov. 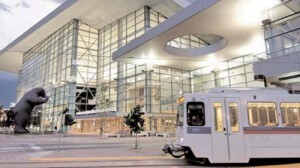 Denver has put itself in the urban planning-spotlight in recent years with its bike share program, its light-rail system, and a host of other transit-oriented development projects, and it will do so again this week as it hosts the New Partners for Smart Growth Conference, Feb. 13-15, at the Denver Hyatt Regency. The U.S. Environmental Protection Agency, which co-sponsors the event, will join local elected officials; city and county staff; state and federal agency leaders; planners; architects; realtors; developers; and others committed to building safer, healthier, and more livable communities at the Conference, which kicks off with an Equitable Development Workshop on February 13. The event will focus on helping communities overcome barriers to sustainable, equitable development. Speakers will include Denver Mayor Michael Hancock; Greensburg, Kan. Mayor Bob Dixson; Moscow, Idaho Mayor Nancy Chaney; Gabe Klein, Former Commissioner of the Chicago Department of Transportation; and Zach Ware, founder and CEO of Project 100. The conference also includes 13 tours of projects in Denver and the surrounding area where participants can see smart growth in action. The Equitable Development Workshop will focus on smart growth through environmental justice, including sustainable development approaches for low-income, minority, tribal, and other overburdened communities. A Healthy Food Systems Workshop, preceding the conference in Denver on Feb. 12, will focus on increasing access to healthy, affordable food while creating economic opportunities and promoting responsible land use. The conference registration fee will be waived for members of the press who provide their press credentials and complete a Press Registration Form before the conference. Registration fees for tours and workshops will not be waived.